Each blog will explain the part of the body affected, how each lift affects that muscle group and recovery time. Each blog will be written in its simplest form so you, the reader, can fully understand the material. This week I will be discussing injury caused to the Shoulder and Rotator Cuff. What is the structure and function of the shoulder? The shoulder is a bone and socket joint. Because of its full range of motion, the shoulder has the greatest motion of any joint in the body. The shoulder is connected to the following bones; the upper arm bone, the collar bone and the shoulder blade. 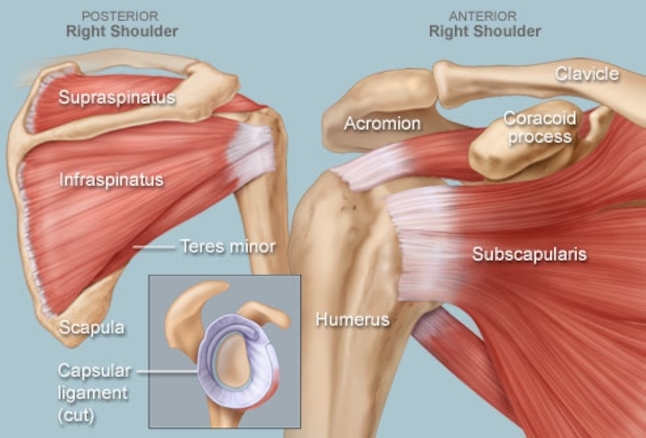 The shoulder is also connected by a complex highway of muscles, tendons and ligaments. You can see right away that damage or injury to the shoulder can be quite complicated if any or all these other parts are affected. This is also why the shoulder is the joint that takes the longest to recover after surgery. All the complex parts listed above give the shoulder the ability to have full range of motion for tasks or sports such as painting, basketball, baseball and even pushups, as well as other activities. This range of motion makes the shoulder the most mobile of all joints in the body but also makes it the most accessible to injury. Squatter’s shoulder – The squat builds the foundation for many other lifts. Bad posture or how the bar is positioned on your shoulders can cause pain or injury. Try doing one squat with a high shoulder and one with a low shoulder placement. Find which position offers most comport and ease of a squat. Any discomfort should be considered as potential for injury if you continue squatting in that same uncomfortable position. Another thing to consider is hand position. Do you favor a narrow or wider placement on the bar? Stability of the bar will impact not only your shoulder muscles, but also how well you can perform that squat. So how do you fix this? You simply need to find your comfort zone. Try a few squats with a low weight bar and different bar and hand placements. If you feel balanced, then continue with this placement and increase your weights over time. If you don’t feel balanced, try some other hand and shoulder placements and find your safe and happy place. Remember, workout burn, and workout pain are two different things. Don’t confuse them both or you might end up having a serious injury. Bench Press – During a bench press, the muscles most commonly injured because of its use is the rotator cuff. Improper technique can cause you to injure or even tear one or more of the muscles in the rotator cuff. Bench pressing at high weights poses higher risks. The placement of your elbows play a key role in the bench press and protecting the rotator cuff from injury. By placing your elbows at a 45-degree angle from your body, you are helping decrease the stress on the shoulders and the surrounding muscles. Dead Lifts – During a dead lift, the upper and lower back muscles are strengthened and toned. The shoulder still plays a role in its movement, especially the rotator cuff muscles. The Dead Lift causes stress on the shoulder due to the weight of the bar pulling down on your arms. The rotator cuff helps keep the upper arm bone secured in the shoulder joint during the lift. Avoid lifting too heavy too fast to avoid injury with the Dead Lift. Body mechanics are also important during this lift. A strong core will also help protect your back. Military Press – Or Overhead Press helps build shoulder strength, but improper technique or lifting too heavy can also cause an injury. Avoid locking the elbows during the upward lift and lower the arms in a slow and controlled movement. Overworking the shoulder muscles is one of the main reasons this lift can cause injury. Other injuries can occur such as ruptured tendon, cartilage tear, or even a dislocated shoulder. Recovering from injury – The best thing to do for this kind of injury is rest, ice the area and take anti-inflammatory drugs, such as Ibuprofen, to help with the pain and improve healing time. Once you are recovered, start again by practicing techniques in the beginning with light weights to prevent a recurring injury. Not lifting too heavy too fast is also very important. The most important thing to remember is that recovery is individualized. If you are not feeling better within a few days or experience severe inflammation or redness at the joint, call your physician for an evaluation.